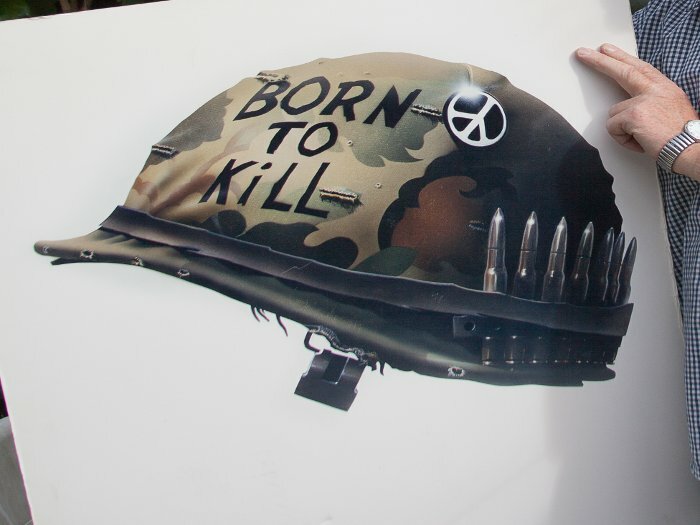 Philip Castle is a British illustrator, most widely known for his airbrush creations of the iconic posters for Stanley Kubrick's Clockwork Orange and Full Metal Jacket, not to mention Ken Russell's The Boyfriend, Tim Burton's Mars Attacks and Jack Nicholson's Goin' South. He also counts among his back catalogue artwork for album covers including David Bowie's Aladdin Sane; Pulp's His 'N' Hers; Metronomy's Night's Out; the Rolling Stones' It's only Rock 'n' Roll (But I Like It) and Paul McCartney's Wings tour, along with countless posters for advertising campaigns, book covers and illustrations. My meeting with Castle arose by chance out of involvement in a research project called NAM: Media, Popular Culture and the Vietnam War, part of the Masters course in photojournalism and documentary photography at the London College of Communication. 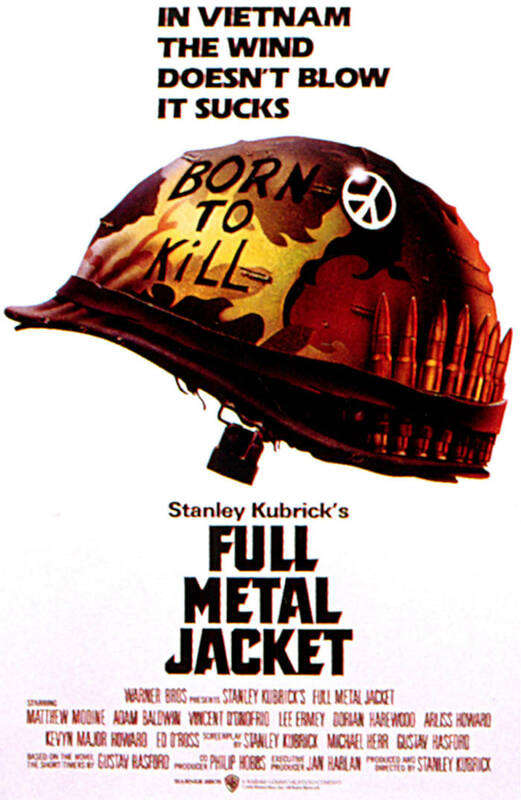 Using the resources of The Stanley Kubrick Archive, held at the University of the Arts London Archives and Special Collections Centre, researchers were asked to make links between images, popular culture, writing and film, among other material, in an attempt to understand the Vietnam war in the context of the modern-media battlefield. As part of my research, I was invited to visit Philip Castle at his home. 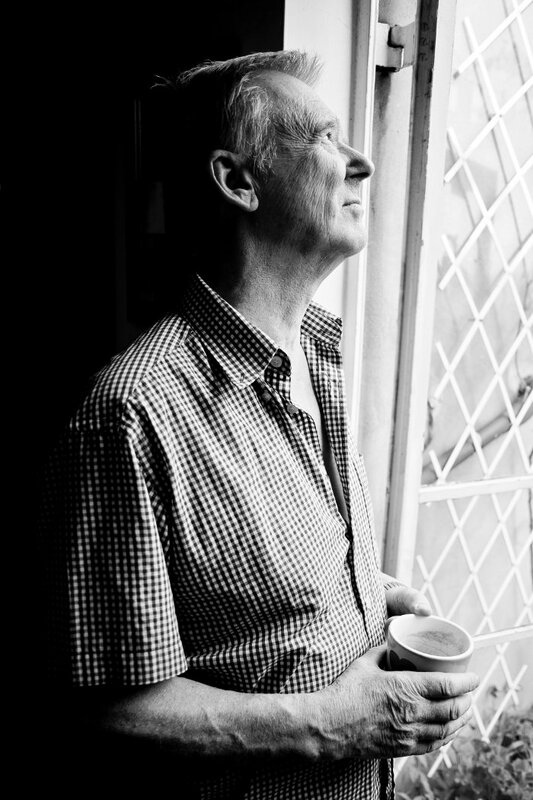 A sprightly and softly spoken man, he was generous with his time and, quite unexpectedly, he made some of his fantastic archive of work available for me to photograph. 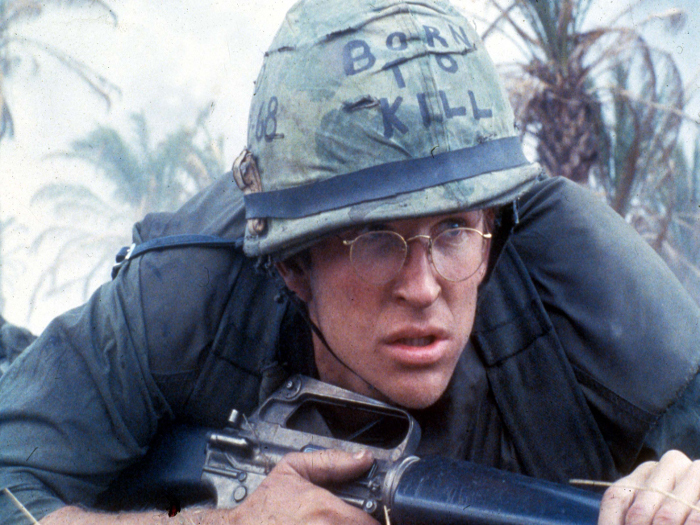 He brewed a pot of tea and we started by talking about how Stanley Kubrick contacted him for the design of Full Metal Jacket. 'My two favourite films of the time were 2001: A Space Odyssey and Dr Strangelove. The latter is possibly one of my favourite, top 10 films,' he told me. 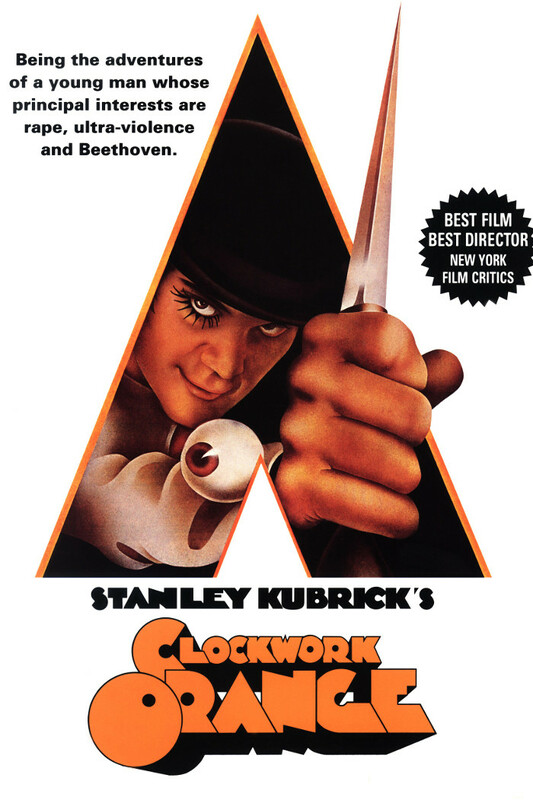 'I had already successfully worked with Stanley Kubrick on Clockwork Orange and he rang me again asking if I knew anyone who could do a painting like Saul Bass. 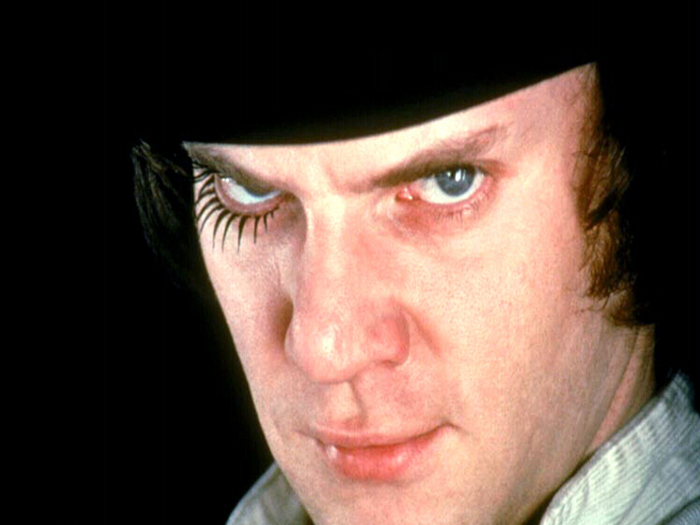 When you get a call from the great Stanley Kubrick, well, there's no question. I said: "Why don't you let me have a go?" 'His first concern was the poster had to work in black and white. He said anybody could make things look good in colour, but it had to be only one column in the Evening Standard and it had to really hit you!' At this point Castle jumped up and asked me to wait while he fetched something. He returned with a battered box and some airbrush work on art card. 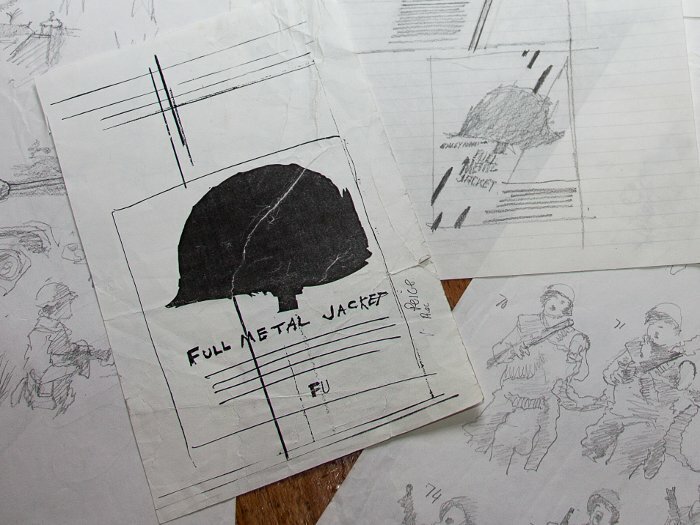 In the box was an amazing array of sketches, handwritten notes from Kubrick and a GI helmet. He began sifting through the contents and laid them out on the kitchen table. 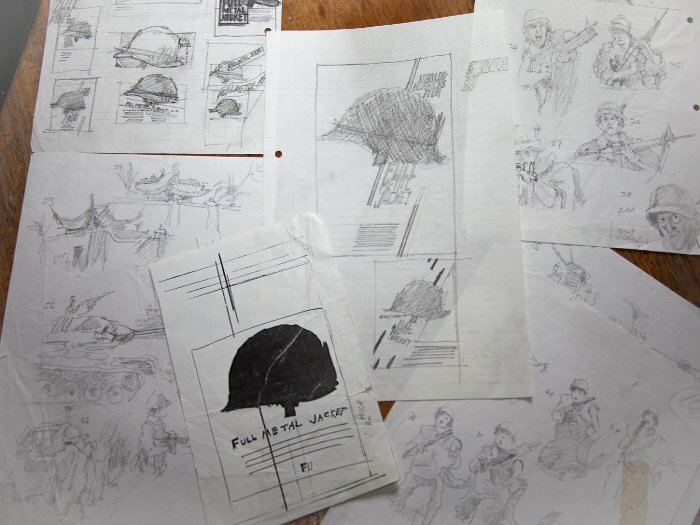 'He sent me a little drawing, a silhouette, and, on one of my visits, he handed the helmet over and I just brought it back. 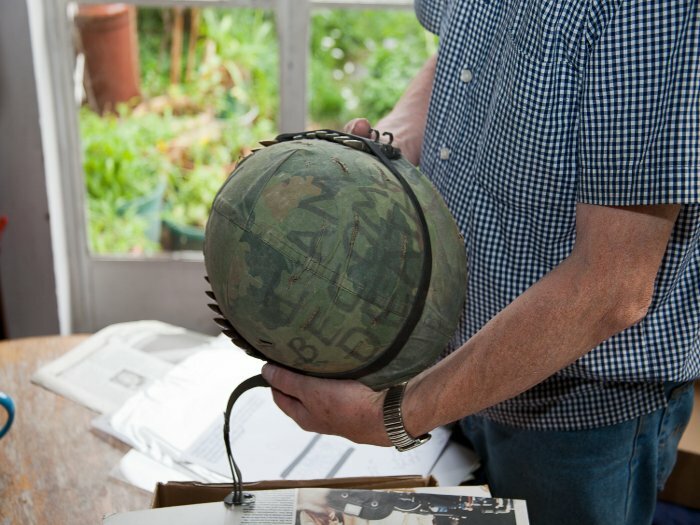 I did the helmet as though it had just been left on a desk, flat; I don't know who had the idea but, just tilting it, as if it were being worn, made a whole difference -- it put life into it. 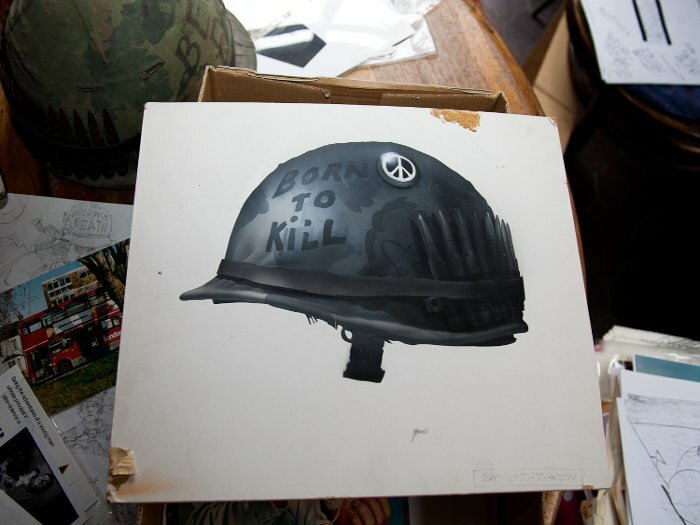 So, here's the helmet, but I see the peace badge has gone; I think I took it off for another job and never replaced it. It's in the house somewhere. 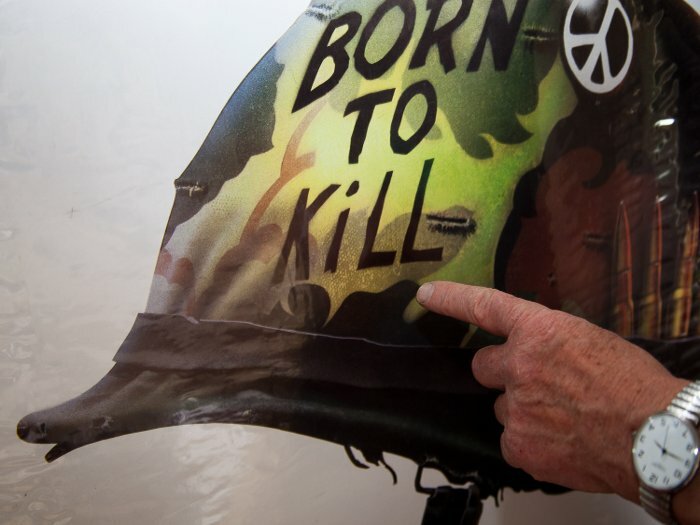 This helmet doesn't have "Born to Kill" written on it, it's the helmet for one of the other actors. 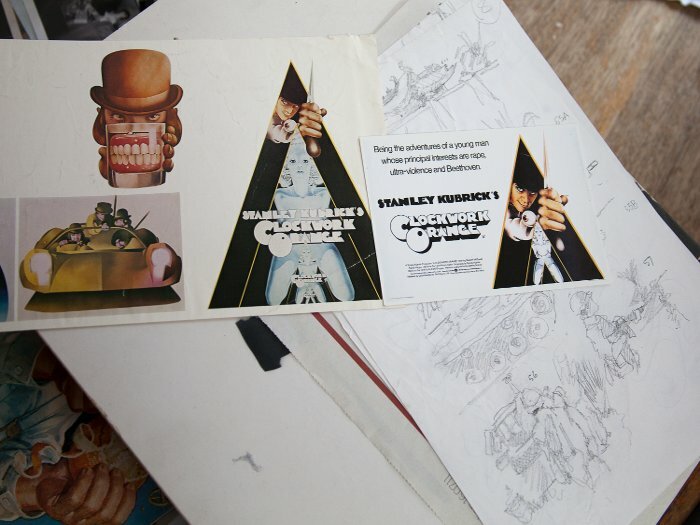 'It was good to get access to such materials; I very much worked one-to-one with Stanley. I would call and say "I've got something to show you", or he would have said "Well, come back next Tuesday", and I'd drive over and bring him material -- sketches and roughs -- to look at. I would talk about the project and he would say what he thought, what needed doing; there was very little adjustment really. Stanley was very professional in meetings, we only talked about business; we didn't chat about the state of the world. I had several ideas but would not develop them too far, just enough to set him off, to get him thinking in a certain way. That's how I work; that's how I would get the ideas over. I didn't experience his "obsessiveness" too much; I would say he was a reasonable man. He knew from the start he wanted the helmet, and once he saw my painting in colour he liked it; it came alive in colour. The black one is a bit of a dead thing. Once we had established exactly what he wanted they just used the colour design of the helmet, but with the all-important tilting effect. 'For the camouflage surface, I painted on to canvas and pressed the material on to give the effect, otherwise I would have had to airbrush it by hand and it would've been hopeless. 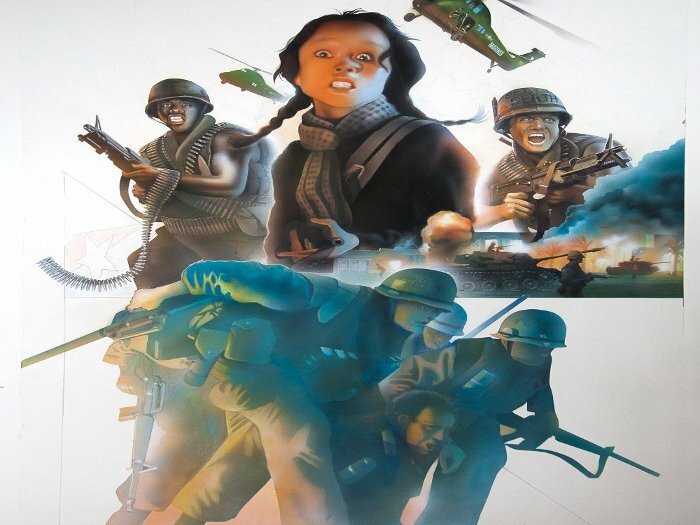 'Some people around Stanley thought that, for certain regions, the helmet image might be too "provocative", so an alternative poster was asked for. I fished this work out last night -- it was never moved forward or used, and it's not been seen before. I guess the helmet is now the iconic image for the film and the alternative poster is more generic in style and content.' 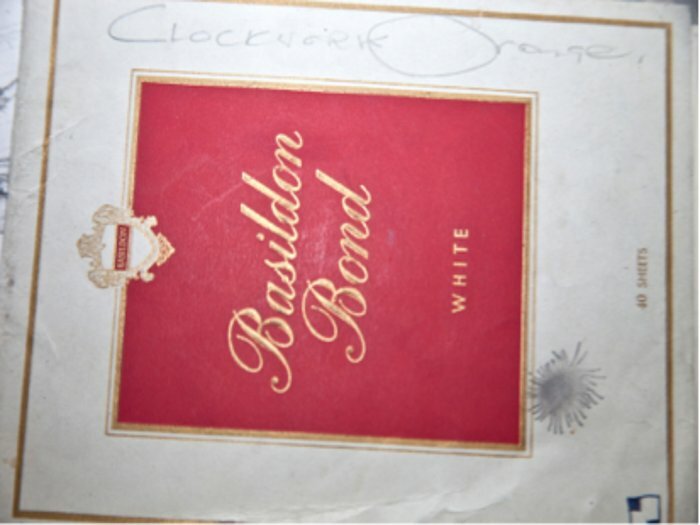 He returned to fishing through the box and pulled out an old Basildon Bond notepad with 'Clockwork Orange' handwritten on the front. Castle described being riled when someone else was given credit for his poster. 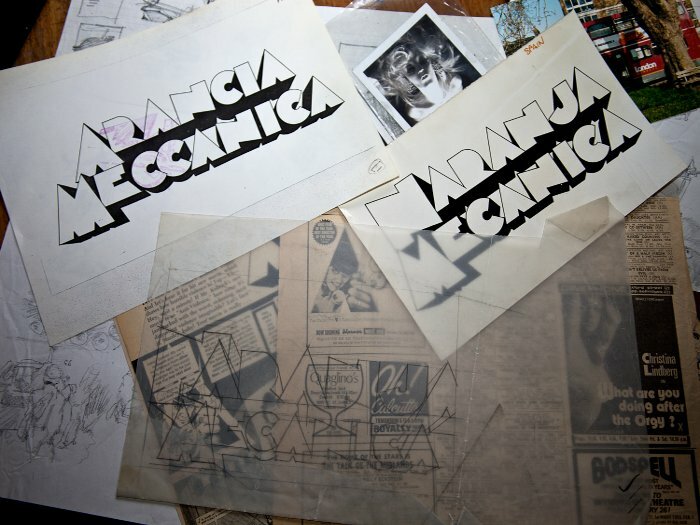 Some of his lettering was also changed: 'I had to do the lettering for different territories. I had no power, I know. They put dots in where I hadn't. The 'E' at the end has been made different and the 'S' is different from my original. But they only used that lettering for the American and English posters. All the others were mine, which I roughed out myself. You can see my 'E' is very distinct. 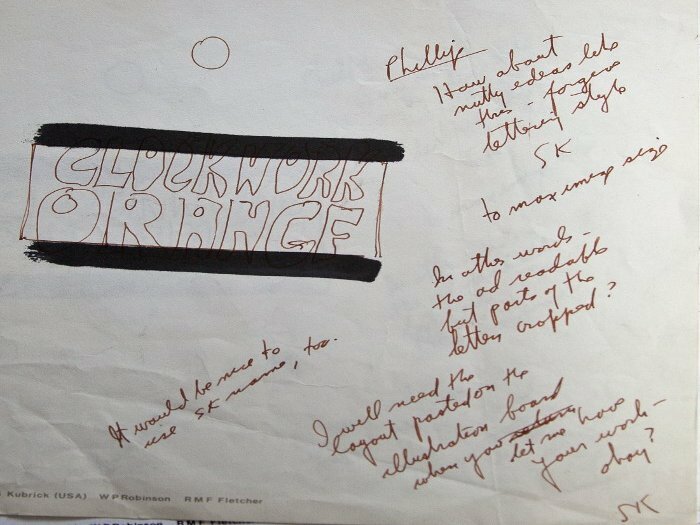 Back to the box: 'Here's one of Stanley's notes to me,' Castle recalled. 'He's talking about lettering and "nutty ideas". I remember he wanted the bowler hat just right, and that was the only thing they had any real objection to. They sent me the hat to get it right. Once Stanley had the last word, they went for it. 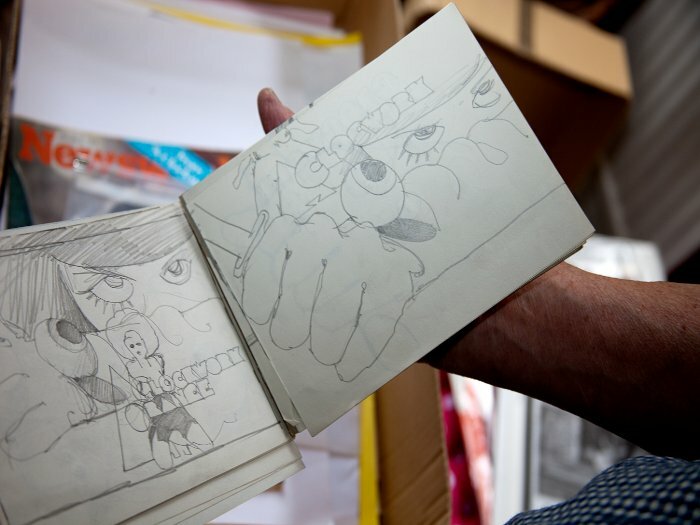 'When visiting him, I liked to actually put the drawings in front of him and discuss them. It was a big deal for me and I didn't want to blow it. But I would do that for any client. I like that, it's great to take your work with you and get the "oohs" and the "aahs" at the end. Otherwise, if that were taken away, it would be like a rat on a treadmill. This work can be very boring. The highs are getting the job in the first place; designing it is terrific, and finishing it off is terrific, but the process in between is long-winded and laborious. It takes a long time and you can't do anything else; you work most of the night, then you get up again in the morning and get on with it. I don't miss all the deadline business. I like not having it. 'I have a Mac and I have used Photoshop -- I absolutely love it, but it has put me out of work! The only differences between using a computer and my airbrush work would be my eye and my design sense and its own particular requirements. I'm just not fluent enough in producing works on a computer. A lot of film posters are photographs now and that makes a lot of sense to me. It's a shame, though -- some great film posters have been illustrated by hand but when it's a photograph the results are well... photographic. I just can't get myself together enough to learn the ropes; there seem to be so many ropes involved now. 'The people who are hiring these days are getting their own age group; they're not interested in an old fart. I work by hand and they would think I was so expensive they wouldn't be interested. You have to put yourself up and say, "I'm available". I should get myself together and do that, I know, I realise that. There is a pleasing circularity to this story. Some time after our tea and chat, we visited The Stanley Kubrick Archive at the London College of Communication together. 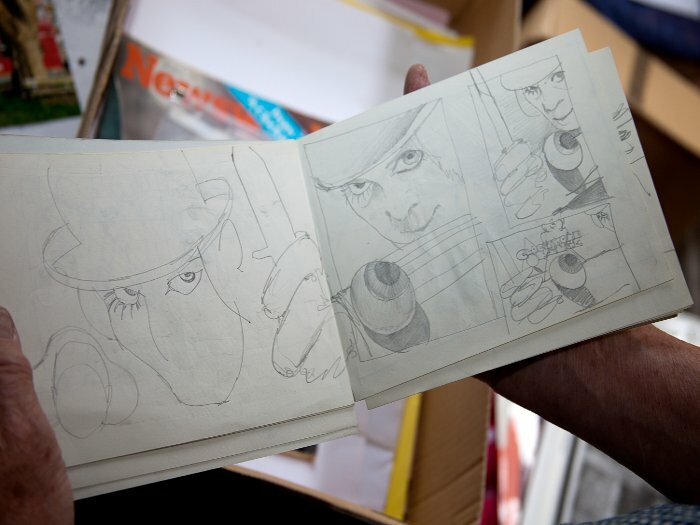 Castle brought along his early sketches for Clockwork Orange and Full Metal Jacket and signed his book, Philip Castle -- Airflow, as a gift for the archive. 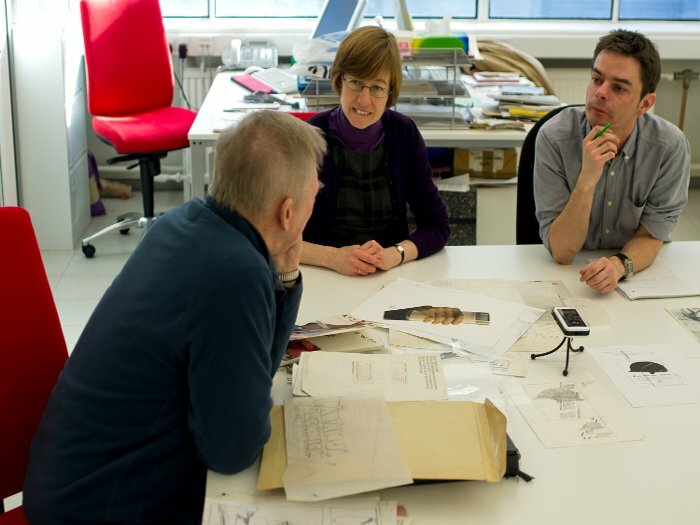 On leaving, he suggested that the archive might one day be interested in receiving and looking after his collection of Kubrickian artefacts. 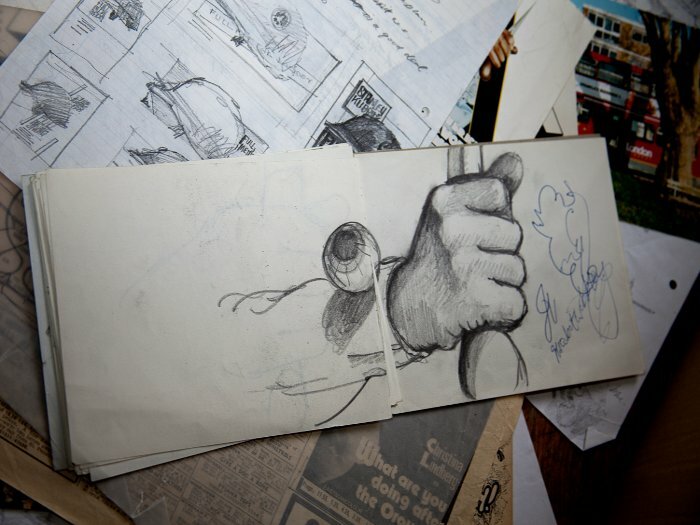 So, hopefully, just as I did, future generations will be able to view at first hand Castle's remarkable box full of illustrations, sketches, movie props and material.